Valley View has a lifetime of experience with horses and using natural training techniques learned from the masters. Valley View has been breeding, raising, and training Arabian horses for over 30 years and trained countless riders who have graced the Arabian Class A show circuit. At Valley View Farms, we implement natural horsemanship to train both riders and horses. With this method, we communicate with horses using the horse’s language instead of trying to make horses learn our language.We consider the horses’ instincts of self-preservation and herding to develop a trusting relationship between human and horse. Once the horse develops trust, everything else comes easily, and the horse looks forward to furthering the bond. We strive to interact with them on their level, taking baby-steps and letting each horse tell us how far they are willing to go. 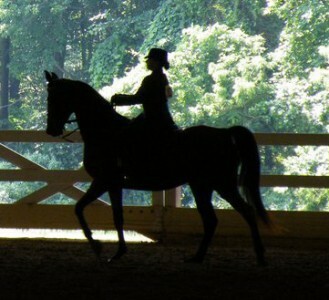 The result is a horse with a quiet demeanor and a willingness to learn. This is the key to getting results without stressing the horse! Students are taught to ride through confidence-building exercises that, step-by-step, form the horse-human bond. Riders come to understand that horses learn to do whatever they are rewarded for. Riders’ goals with their horses are broken into a series of small steps and worked through from a position of confident control. This allows riders to overcome any fears and builds a solid team of horse and rider. Once here, students’ accomplishments are limitless. For more information, see our Lessons and Training page.